With Intercom Acquire Pro, you can proactively reach out to and chat with visitors on your website based on what they do. You can send messages based on what pages they visit, how many times they visit them, how long they stay on them, and what browser language they have. Setting up a visitor auto message takes just a minute. 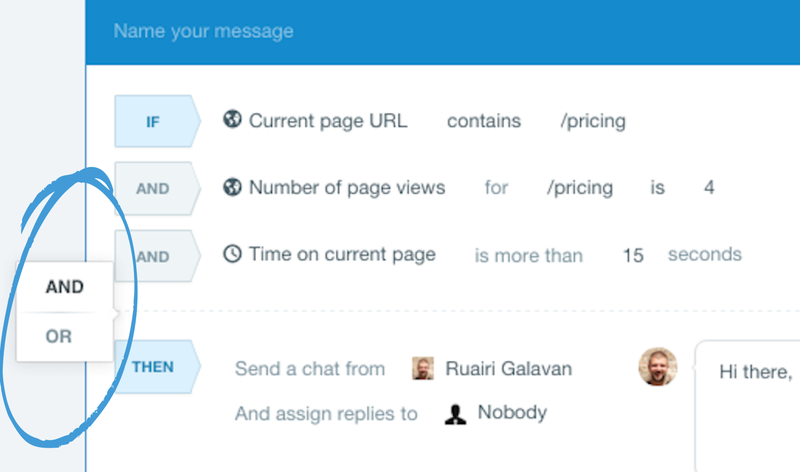 Select new message from the 'Messages to visitors' tab in the Automatic Messages section of Intercom. Set the conditions under which you wish your message to send. (Important: you can combine as many rules as you like to target messages based on exact behavior. Just hover over the left side of the rules window and select And or OR to add another rule. This could be the perfect time to tell them even more about that particular product, offer a discount, or simply just offer to answer their questions. If a visitor stays on a page for more than a minute they may be showing signs that they could use some help. Why not set up an automatic message to go to each user that stays on any page for more than 60 seconds.